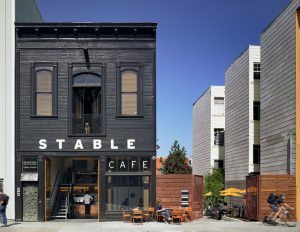 This week’s dog friendly choice is centrally located in the Mission District at Stable Cafe. The Cafe located on Folsom between 17th and 18th Streets has been welcoming dogs and their parents for years. We like the roast beef sandwich or bacon and brie panini on Semifreddi’s bread. But all their food is tasty. And the open air patio makes for a great setting for a weekday lunch or a weekend brunch with your pooch at your side. Coffee lovers will adore the Four Barrel coffee they brew up. They often have treats for pups and water on tap in the bowls around the cafe. They are not open for dinner so this option is only for those with a flexible schedule or weekend to explore. Stable is a hearty 50 minute walk from our Lodge location but just an eight minute drive. And just a half mile or 5 minute drive further from our Doggie Daycare on Lombard.